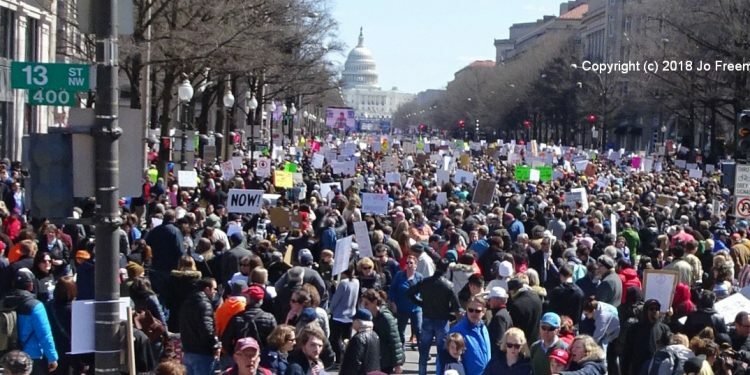 Millions of people marched in over 800 US cities and in several other countries in response to the mass shootings that have catalyzed support for gun regulation. The main march in the District of Colombia was changed to a rally as the expected numbers grew. Instead of marching up Pennsylvania Ave. from 3rd to 12th Streets, people packed it, as well as some surrounding streets. A very large stage was erected on 3rd Street near the Capitol. Jumbotrons and large speakers lined Pennsylvania Avenue. for several blocks. Organizers appear to have learned from the deficiencies of the massive women’s march in 2017, where only some of the crowd could hear, let alone see, any of the speakers. My application for press credentials was denied. Since I couldn’t gain access to the camera riser in order to photograph the speakers on the stage, I hung out at Freedom Plaza, 13 blocks away. With a long telephoto lens, I could see a Jumbotron and barely see the stage at the base of the Capitol. It was a good spot from which to photograph signs, as people flowed onto the Plaza on their way to the rally. These signs were largely homemade and some were very creative. There were a limited number of professionally printed signs. While some were anti-Trump, that was a minor theme. The NRA was a preferred target. Some recycled 1960s sentiments. One said "Hey, hey, NRA! How many kids were killed today?" During the Viet Nam War, the chant was "Hey, hey LBJ. How many kids did you kill today?" Signs directly attacking the 2nd Amendment were rare though it is the main shield used by the NRA to defend and expand gun possession. 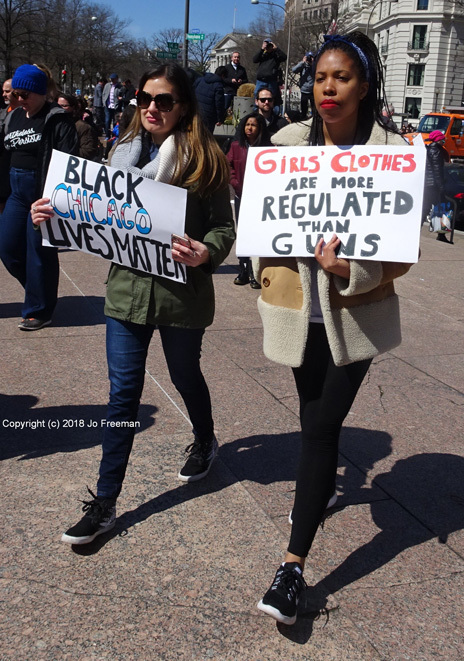 March 24 had a milder flavor than most protests, in part because the teenagers who organized it had parental approval and lots of adult support. Even the cops were cool; police would prefer to be the only ones to carry guns. There were no incidents. The DC National Guard blocked the streets and cops directed traffic elsewhere. If the issue of gun violence had not been so grave, it would have felt like a celebration rather than a protest. Many organizations held backup events, before, during and after the rally. The Woman’s National Democratic Club held several at its large house in Dupont Circle. They featured speakers whose friends and relatives had been killed by guns. The Club provided materials for participants to make their own signs and gave out "evil eye" mittens. A few blocks away, seniors from a nearby retirement home greeted those going to the rally Saturday morning. Gays Against Guns brought a bus from NYC. They held a mini-rally near Freedom Plaza with signs, speakers, and street theater. This included a runway where a gay man impersonated Rep. Barbara Comstock (R - Va), who is high on the list of Representatives GAG wants to defeat. The New York Avenue Presbyterian Church was open for demonstrators to drop in, freshen up, eat snacks and watch the stage on CNN. Indeed, it was probably the best place to see and hear without being in the middle of a crowd directly in front of a Jumbotron. Staff from the Democratic National Committee and volunteers from the League of Women Voters asked participants to sign statements that they would register to vote. The DNC passed out stickers to young people with the year they would reach voting age. While this was not the largest march/rally I have been to (despite the claim by the March’s professional PR firm that it was "Said To Be Largest Ever in Capitol’s (sic) History") it may have been the most diverse, at least racially and by age. (It’s hard to read class from personal appearance). Although the mass school shootings have been at largely white schools, minority communities suffer far more gun violence and deaths. Reducing gun violence is one issue for which one can truly say "Black and white together, we shall overcome." DNC Winter Meeting: Using Social Media and Databases to "Create the Electorate We Want"